See our Double Vertical Wood Splitter with Conveyor in Action! See our Single Vertical Wood Splitter with Conveyor in Action! 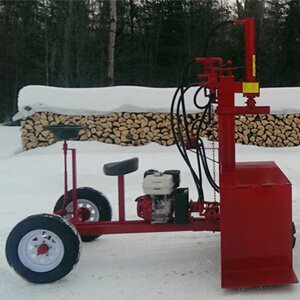 See our Buggy Wood Splitter (Self-Propelled) in Action! 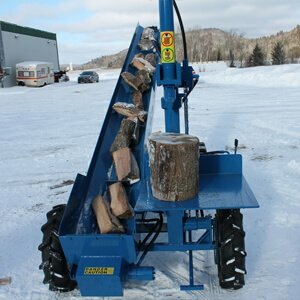 See our Buggy Wood Splitter (Static Tow Behind) in Action! Power Split International is proud to offer its full line of firewood splitters and conveyors. 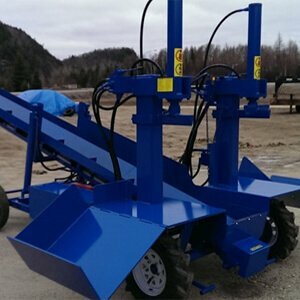 Our unique line of wood splitters are the only self-propelled splitters on the market. We offer the highest output of production of any splitters on the market today. Our standard 5 second cycle time coupled with a vertical design enables the worker to control the quality of the wood 100%. There is no wasted wood when you use one of our splitters — every piece is perfect, always. Furthermore, the unique tables enable the worker to work in an ergonomic position that is not tiresome, thus improving his productivity. Our line has something for everyone from the weekend warrior to the high production outfit. 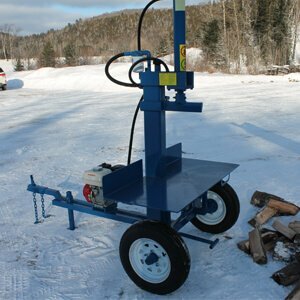 Our wood splitters will save you time and money as well as manufacture a lot more wood. “Stop bringing the wood to the splitter – start bringing the splitter to the wood” is our motto, so inquire about our free video and leasing options.